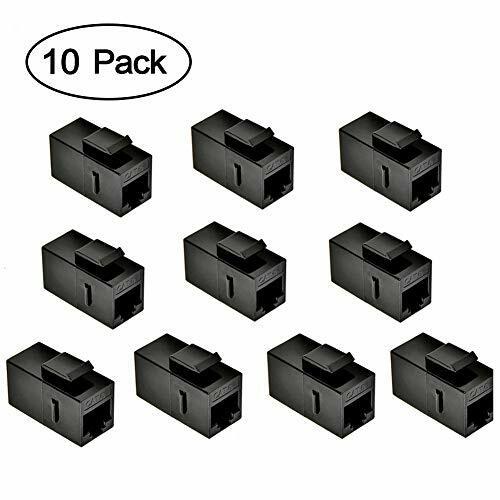 The MACTISICAL RJ45 Keystone Jacks have a standard keystone face size for using with 23 or 24 AWG solid cables into patch panels or wall plates with standard keystone blanks. The 110-type terminations are color-coded with both T568A and T568B wiring schemes. Dual IDC modules use either 110 or Krone impact tools and include dust caps that assist with cable strain relief. Constructed of high-impact, fire-retardant plastic with gold-plated contacts, these Keystone Jacks meet or exceed Category 6 performance in compliance with the TIA/EIA 568-C.2 standard. ★ CAT6 HIGH PERFORMANCE STANDARD: The technology and function of this CAT6 unshielded keystone jack has higher performance than the TIA/EIA and ISO CAT6 standard, fits for patch panels, surface mount boxes or wall plates (face plates). ★ HIGH QUALITY MATIRIAL & TECHNOLOGY - Gold plated contacts which prevent the oxidization and easy snap-in retaining clip ensure a secure and corrosion free connection. ★ R0HS STANDARD: Supports T568A and T568B wiring with color coded 110 blocks. It Supports 110 or Krone dual type termination and accepts 22 or 26 AWG solid Ethernet cables. ★ DOUBLE FEMALE RJ45 PLUG: This inline coupler connects two separate category 5e/6 cables (depending on type you bought) through a RJ45 keystone coupler. Double female cat6 keystone can be used with Cat.6, Cat5, CAT5e Ethernet cables. ★ COMPACT DESIGN & MULTIFUNCTIONS: Keystone Snap-in Cat6 couplers provide a full range of solutions for voice, home networking, home office, audio, video and more. It works with any wallplates and blank patch panels. If you have any questions about this product by MOERISICAL, contact us by completing and submitting the form below. If you are looking for a specif part number, please include it with your message.